Bradley Mefford (left), Oliver Grim and Jayden Gibson went sledding down the hill in front of Urbana High School on Tuesday as cleanup continued after Winter Storm Harper - which closed local schools. By Wednesday afternoon, warmer temperatures and rain were already eating away at the weekend’s heavy snowfall. Sledding at UHS is a winter tradition. Bradley Mefford (left), Oliver Grim and Jayden Gibson went sledding down the hill in front of Urbana High School on Tuesday as cleanup continued after Winter Storm Harper – which closed local schools. By Wednesday afternoon, warmer temperatures and rain were already eating away at the weekend’s heavy snowfall. Sledding at UHS is a winter tradition. 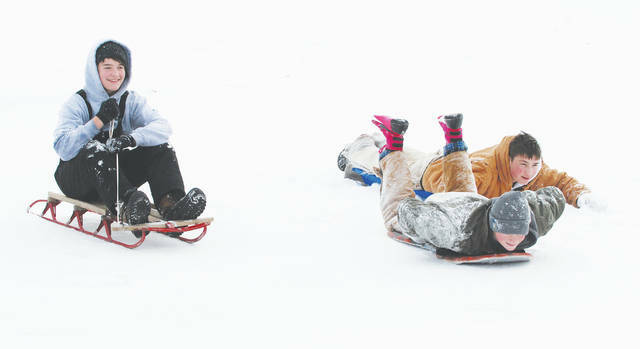 https://www.urbanacitizen.com/wp-content/uploads/sites/36/2019/01/web1_sledders.jpgBradley Mefford (left), Oliver Grim and Jayden Gibson went sledding down the hill in front of Urbana High School on Tuesday as cleanup continued after Winter Storm Harper – which closed local schools. By Wednesday afternoon, warmer temperatures and rain were already eating away at the weekend’s heavy snowfall. Sledding at UHS is a winter tradition.